Prophet Muhammad (Allah’s peace and blessings be upon him) was a wonderful and exemplary human being who was concerned for the spiritual welfare of humankind, and endured great hardship to convey and explain God’s final message. Every Muslim loves him, and indeed love for him necessarily follows from belief in God. I have personally seen signs of deep love for him among various flavors of Muslim, across sectarian and ideological spectra: Sunni, Shi`i, Sufi, Salafi and others, and this is one of numerous central teachings that unite us as Muslims. I feel it is important to keep this in mind, at this time of year in which controversies emerge — sometimes even rage — over whether (and if so how) to celebrate the birthday of the Prophet (peace and blessings upon him). If we consider the situation carefully, I am confident we can greatly reduce, hopefully even eliminate, stereotyping and condemning other Muslims with whom we happen to disagree on this matter. If you don’t celebrate, then realize that those celebrating the occasion are moved by love for the beloved Prophet, even if you disagree with some of the specifics of how they are celebrating. You might believe they are wrong or mistaken in those details, but you cannot cast aspersions on their sincerity. Give them the benefit of the doubt as far as possible if you see or hear something objectionable from them. If you do celebrate, then avoid the temptation to think that those not celebrating are lacking in love for the beloved Prophet. Whatever your view, realize that the Muslim holding the opposing view on Mawlid might be better than you (overall and in the final analysis), and perhaps even love the Prophet more. In our world, we need more dialogue, tolerance and unity between Muslims, and we positively want to avoid entrenching ourselves into narrow, exclusive moulds. We may note that when Hindus in India were objecting to Shi`ite Muharram processions (which are often considered a heretical practice by Sunnis), a prominent Sunni (Hanafi Deboandi) scholar, Moulana Asraf Ali Thanwi, told Sunni Muslims in India to support the Shi`ites right to perform them. There is no disagreement that the Prophet’s birthday was not celebrated as a festival until approximately 600 years after him, and therefore no Muslim would be so bold to claim that it is a religiously mandated festival on par with the Two Eids (al-Fitr and al-Adha). Yes, many scholars across history have found such celebration to be acceptable, within certain boundaries, but there is further difference of opinion on what precisely those boundaries are. Those who endorse the celebration resort to general texts and concepts that show the legitimacy of feeling joy for the coming of the Prophet, and the permissibility of giving lectures about his life and reciting poetry praising him. e.g. Various hadiths on the virtues of conveying from the Prophet, and incidents in which some of the Companions recited poetry praising the Prophet. Some might add as a partial justification: the importance of finding opportunities for keeping Muslims (and especially the children) in touch with their religion while living as a minority in a non-Muslim country. ii) Indeed, in some parts of the Muslim world, some people effectively see the Mawlid as a required devotional act, such that those who choose not to attend are considered to be deficient in their Islam. Conversely, some ignorant folk come to believe that by attending the Mawlid to show love for the Prophet, they are automatically good Muslims even if they neglect their daily prayers and other religious obligations. iii) Information inaccuracy: it is not uncommon to find speakers at a Mawlid quoting narrations/hadith that are extremely weak in their transmission or even fabricated. Similarly, some people exaggerate in praising the Prophet, in ways that he himself may have disapproved of, and which in some cases can even be tantamount to (or at least close to) polytheism (shirk). The shaykh of some of our shuyukh, the Morocan Shadhili master `Abdullah al-Ghumari (Allah’s mercy be upon him) compiled a small booklet warning against some of these widely-quoted yet unreliable hadiths. iv) Sometimes, there are other objectionable aspects to Mawlid gatherings, such as unrestrained mixing between genders, or neglect of prayer-times during the celebration. 1) Make sure your regular daily conduct and behavior reflect your love for the Prophet (Allah’s peace and blessings be upon him). 2) Exercise wisdom in your dealings with those who disagree with you about the Mawlid. If you believe they are wrong/mistaken, then there are etiquettes for dealing with disagreements. Dialogue, based on acknowledgement of the other’s sincerity and meritorious deeds, along with a sincere desire for their (and your own) improvement will go much further than labelling, condemnation and polar isolationism. Before closing this article, I must make some comments on a personal note. I will say that I do have reservations about Mawlid gatherings that include the pitfalls mentioned earlier, and if I know for a fact that some of the more serious infractions will be present, I would decline participation. However, if (as I was recently called upon to do so), I am invited to give a lecture about some aspect of the Prophet (peace and blessings upon him and his Household), then I don’t find myself obliged to decline, nor to interrogate the attendees and organizers on their beliefs about it, but I go in clear about my own intentions. We read that Imam Malik once entered the mosque after `Asr and directly sat down, for he believed the Tahiyyat al-Masjid prayer to be impermissible during this time. But when a boy innocently told him to stand up perform the prayer, he obliged, later explaining, “I feared being one of those who ‘when they are told to bow, they do not bow.’” It is an honor for me to speak about the Prophet, and if my words can be of some benefit, then I am happy. However, my speaking at such a gathering should not be taken as an acceptance or endorsement of everything said and done there by others. I might very well disagree with some things, but even if the disagreement is not within what I would consider legitimate scholarly disagreement, I will try to give them the benefit of the doubt, with the hope that they are rewarded for their good intentions, and that – at some point – they come to realize where they had been going wrong. It is not always a priority (and sometimes more damaging than beneficial) to speak out against something one sees as wrong. Imam Ahmad ibn Hanbal disapproved of decorating pages of the Qur’an, but when he was asked about a man who had spent a lot of money adorning a Qur’an with pure gold, he did not call for condemnation, but rather made a remark indicating that there are worse uses to which the gold could have been put. I am acutely aware that we do have bigger and more pressing problems in our communities than discussing the Mawlid, but it is precisely because of this fact that I feel it is important for us to be able to properly contextualize the Mawlid and take it in stride as we (hopefully) continue in more lofty pursuits. May Allah bless Muhammad and his Household and grant them peace. 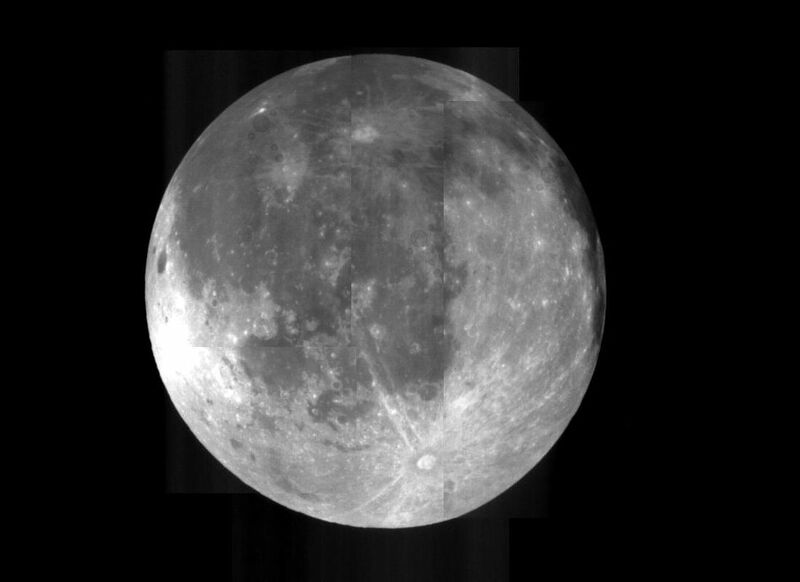 ACKNOWLEDGEMENT: Image of moon from http://nssdc.gsfc.nasa.gov/image/planetary/moon/clem_full_moon_strtrk.jpg, accessed 1/21/14, 10:46pm.